Who is your favorite cartoon character? Mine is GARFIELD. That's the law of KARMA. What you sow is what yyou reap. If you do good, then destiny will also be good to you, that's goodd KARMA. And if you do bad, then you will also expereience bad things in your life. That's baadd KARMA. i wanted to know if you believe this. oops sorry, i don't know how that post came there. I'm reallyy sorry, it's suppose to be on another topic. who'se kinikuman? is that anime? Me too...i like Garfield eversince. wow! Tom and Jerry rocks. 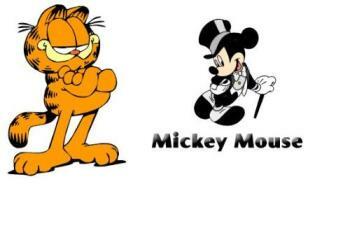 My favorite cartoon characters are Garfield and Mickey Mouse . what's the name of the dinasaur again..i already forgot. there are many cartoon character i like, such as fushuke(ninku), shrek(the shrek) and avatar. The most romantic cartoon character is shrek. mine's Lupin. i really like the cool antics that he have..lol..
mine is tom and jerry.